28 Week Pregnancy Update- Hello Third Trimester! You're in the home stretch! These are the first words I saw when I woke up yesterday morning and opened my pregnancy app. It's so hard to believe that this week marks the beginning of my third trimester. I feel like time has gone by relatively fast and now I'm in countdown mode. I still have a ton of things to get done before baby Smith arrives, but I am happy with the progress that I've made over the past few weeks. In other news, I booked a maternity and newborn shoot with Hilleary Photography! She takes some really beautiful photos. Now onto securing a location for the shoot! How far along? 28 weeks and 1 day. Baby’s size: This week baby Smith is the size of a large eggplant. Weight gain: I oddly lost 1 lb as of my appointment last week, which put me at total weight gain of 13 lbs. Energy: I'm so thankful that I still have energy. That is if I get at least get my 7 hours of sleep and make wise food choices throughout the day. Appetite & Food Cravings: As I mentioned before, breakfast is pretty much the only thing that excites me right now. (I may or may not have purchased Toaster Strudels yesterday.) I'm currently loving yogurt with fruit and granola with a cup of coffee of course. I had an acai bowl from Vintage Coffe & Cafe the other day and it was right up my alley. Thankfully I don't have food aversions, just a lack of room in my belly for the things I want to eat. I feel like by the time dinner comes around, I'm so full from all the things I've consumed throughout the day that I have little interest in sitting down to have a meal. Pre-pregnancy I would eat breakfast, a mid-morning snack, lunch, an afternoon snack before the gym and dinner. These days I'm still full from lunch by the time I'm ready to head to the gym, but I force myself to snack on a little something for energy. Workouts: I have to make more and more modifications with each workout, but that isn't stopping me from going to the gym. I've learned some simple switches that are just as effective and leave me feeling like I still put in the work. The rower is a becoming a little more uncomfortable each week but I continue to pace myself and push through. I'm so thankful that I have supportive trainers and gym friends to encourage and support me as well. Sleep: The snooze button and I have become B.F.F's. And slow moving Saturday mornings are my favorite! Movement: I'm beginning to notice a big difference in all of his movements these days. I noticed that he's been getting the hiccups lately and the feeling is so different. It feel like constant little ticks in my stomach that last for about a minute or so. His regular movements are getting much stronger and more visible through my clothing. It's the coolest feeling and probably one of the things I'm going to miss most after I give birth. 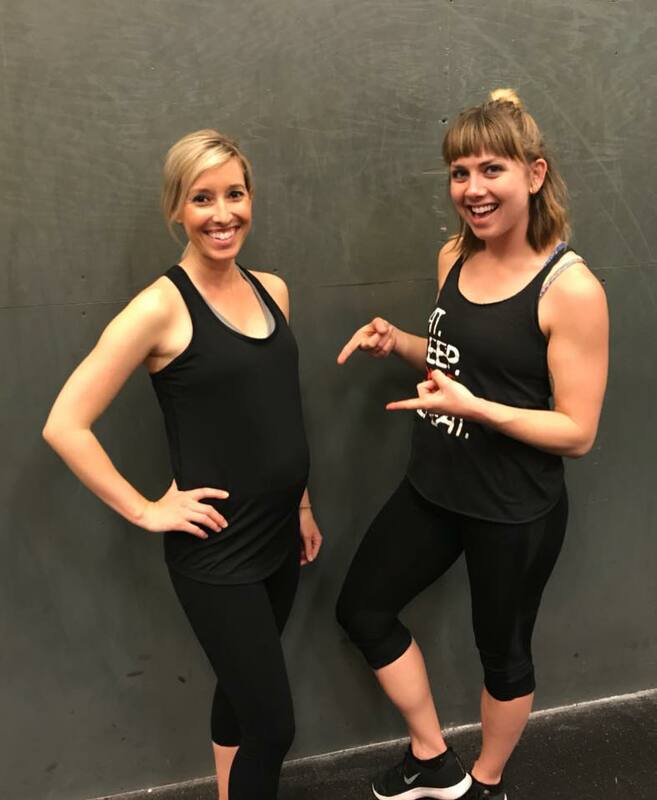 Wardrobe: THESE MATERNITY WORKOUT LEGGINGS ARE A GAME CHANGER! I stumbled across these at target and wish I had purchased them sooner. They are making my workouts so much more enjoyable. Prior to these, I was wearing my normal workout pants which were incredibly uncomfortable. You better believe I'll be back in target this weekend to scoop up a few more. I'm hoping to find a cropped pair because these are full length and a little too long for my short legs. In other news, I'm frantically searching for a dress to wear in my maternity photos and to some of my showers. Shopping for baby: I bought this stroller, which came in a few days ago and I'm so excited. Something about this delivery made things get even more real. Nursery Updates: So far we have the glider, dresser/changing table, crib and mattress. I still need to order bedding for the crib, find a bookshelf, and find a few other little things. Overall, I think we've made some good progress, but will feel much better when we start moving all of these things into the actual room. Right now pretty much everything we have is either still in a box or stored in the garage. Here's a peak of the dresser I bought. It was a dark navy blue which was pretty, but I didn't want it to be the main focal point in the nursery, so I decided I wanted it white. My sweet mom and my brother's girlfriend made a special trip to Charleston just to paint it for me. I don't know what I would have done without their help! Here's a peak of the before and after paint job. I still have to put the hardware back on but we've been letting it dry. Doctor's Visits: I'm on a two week schedule with doctor's visits these days. I go back next week for another checkup. We also have a hospital tour scheduled for today. Whit and I have never been to the hospital I'm delivering at so we thought it would be a good idea to get a lay of the land beforehand. © A Polished Palate | All rights reserved.